Prathu's Food: April 2011 - Passionate Cooking for Vegeterian Food. Today I am posting a traditional tiffin item of Maharashtra, Karnataka, taken during fasting. Once you take this we will never feel hungry whole the day, our tummy will be that much heavy with this food, it is also very tasty food. drain water completely and leave for 3 to 4hours. keep mixing it from time to time and sprinkle some water so sabudana is not completely dry. After 4hours the sabudana will be spongy. Add salt, sugar, haldi, chillipowder, lemon juice and ground nuts and mix well. Heat oil, add jeera, saute for 2 minutes, then add chopped green chillis, curry leaves, grated cucumber, saute for 5 minutes in a low flame and the add potatoes cut into fine cubes. When the potatoes are almost done add sabudana and mix well. Keep on simmer for 5 to 10 minutes till sabudana is cooked. Sabudana will change color once it is cooked. Remove from fire and serve hot garnished with coriander leaves and grated coconut. Heat a pan, add groundnuts and saute till groundnuts pop, allow it to cool. Take a mixer jar, add groundnuts, putani, green chillies, ginger, salt, corinader leaves, little water and grind to a coarse paste. Heat 1/2 teaspoon of oil in a kadai, add groundnuts, jeera, coriander seeds, saute till it pops (app 3 minutes)and remove from heat and let it cool. Heat 1/2 teaspoon of oil in same kadai, add green chillies, saute for a minute, then add chopped ridge gourd and saute for 5 minutes in a low flame, and remove from heat and let it cool. Take a mixer jar and add green chillies, ridge gourd, jeera, groundnuts, coriander seeds, salt, sugar, tamarind and grind it to a coarse paste. Add popu/tampering to coarse paste, Serve with Hot rice/paratha'. Mix wheat flour, salt, suger, oil, enough water to knead a soft dough like chapathi, keep it closed for 10 minutes. Boil tur dal in a pressure pan with 2 cups of water and keep a side. Heat oil in a cooking vessel, add mustard seeds, let it splutters, then add split black gram dal, jeera, hing, curry leaves, saute till dal turns red. Add chopped tomato, turmeric powder, saute till tomato turns soft, then add tamarind juice, salt, red chilli powder, sambar masala, jaggery, saute for 5 minutes. Add cooked tur dal, water if required, saute for 10 minutes in a low flame, mean while divide the dough into 4 Lemon sized balls, roll the balls into circular sized like chapathis (slightly thicker than chapathis). Observe that chapathi should not be too thicker nor too thinner it should be medium. Cut that chapathi into diamond shape using knife(any shape), add this diamond shaped pieces to dal and close it with a lid. Saute till diamond shaped dough cooks evenly in a low flame(if you check with laddle it should be cut softly). It will take app. 10 minutes. Place khoya, sugar and milk in a heavy-bottomed pan. Cook on a low flame, stirring continuously till all the moisture is gone and it leaves the side of the pan. Mix cardamom powder Knead to a smooth mixture with your hands when cool, then form into small round balls. Garnish with Cashews/Pistas, badam and serve. Mix well two flours, soda, salt, red chilli powder, jeera and add enough water and mix well that it forms a thick batter, similar to idli batter. Heat enough oil for deep frying in a deep frying vessel. It should be piping hot, reduce flame to medium and use your fingers to drop the batter in the oil to form small fritters. Deep fry till they turn golden brown. Use a ladle to keep turning the fritters so that it cooks on all sides, Keep a side. Heat oil in a kadai, Add mustard seeds, let it splutters, then add split black gram dal, jeera, curry leaves and saute till dal turns red. Add Oakra/Bindi, saute till it turns light brown, then add paste of ginger, green chillies, add chopped raw mango, add little amount of water, saute till vegetables cooked evenly. Mix curd with water to make thick butter milk and add this to kadai, add salt, saute for 2 minutes. Mix besan flour with 3 tablespoons of butter milk and add this to kadai, cook till the buttermilk turns like thick gravy. Remove from heat, add fritters and mix well. Serve as a side dish with hot rice. Heat Kadai and saute Bombay sooji for 5 minutes, till sooji color changes. Heat oil in a kadai, add mustard seeds, saute till it pops, then add split black gram dal, jeera, groundnuts, curry leaves, cashew nuts, saute till dal turns red. Add chopped green chillies, saute for a minute. Add chopped cabbage, Potato, turmeric powder, saute till vegetables cooked well, then add tomatoes, saute for a minute, till tomato turn soft. Add water , cook till water gets boiled. Add sooji rava, stir continuously to avoid lumps, add coriander leaves, ghee, close it with a lid, adjust flame to simmer, saute for 5 minutes. Take a wide opened vessel, add wheat flour, salt, grated raddish, cumin seeds, chilli powder, oil, grated carrot, methi leaves, coriander leaves to knead a soft dough( no need to add water as raddish releases water while mixing), If Dough is soo hard without water then add little amount of water.Be carefull while adding water. Cook on hot tava applying oil/ghee to both sides till brown spots appear on both sides. Serve it with a chutney or fresh thick curd. Heat 1/2 teaspoon of oil in a kadai, add green chillies, saute for a minute, then add mint leaves and saute till leaves are evenly cooked and reduced to almost 1/2 cup, remove from heat and allow it to cool. In the same pan add jeera, sesame seeds and saute for few minutes untill it pops, remove from heat and allow it to cool. Take a mixer jar and add green chillies, mint leaves, jeera, sesame seeds, salt, jaggery, tamarind, turmeric powder, little water and grind it to a coarse paste. Heat Oil in a kadai, Add mustard seeds, saute till it pops, add split black gram dal, jeera, curry leaves, saute till dal turns red. Add chopped cabbage, saute for 10 minutes in a low flame(closing with a water filled lid). Add green chilli paste, turmeric powder after cabbage cooked well, saute for 3 minutes by closing it with the same lid. Add salt, grated coconut, mix well, saute for 5 minutes by closing with a lid. Cook tur dal in a pressure pan by adding 2 cups of water and keep it a side. Heat oil in a kadai, add mustard seeds, saute till it pops, then add split black gram dal, jeera, curry leaves, hing and saute till dal turns red. (Can add tampering after preparation of sambar). Add all vegetables, half cup of water, when vegetables are half cooked, add tamarind juice, salt, jaggery, cook for 10 minutes until rawness of tamarind disappears, add 1/2 cup of water..
Add MTR sambar powder, cook for 8 minutes. Cook toor dal in a pressure pan by adding 2 cups of water and keep it a side. Heat oil in a kadai, add mustard seeds, saute till it pops, then add split black gram dal, jeera, curry leaves, hing and saute till dal turns red. Add chopped methi leaves, saute for 5 minutes (the quantity will reduce to appr. 2 tablespoons, the add chopped tomato, turmeric powder, saute till tomato turns soft. Add tamarind juice, salt, red chilli powder, jaggery and saute for 5 minutes in a low flame. Add boiled toor dal, mix well, saute for 5 minutes, remove from heat and garnish with coriander leaves. Heat oil in a kadai, add mustard seeds, saute till it pops, then add split black gram dal, jeera, curry leaves and saute till dal turns red. Add chopped carrots, mix well, saute for 5 minutes in low flame closing it with a lid. Add turmeric powder, saute for 2 minutes, add 1/2 cup of water, saute for 5 minutes by closing it with a lid. Add salt, chilli powder, coriander, groundnut, sesame powders, saute for 3 minutes, remove from heat. Now add chopped coriander leaves. Heat Oil in a kadai, add mustard seeds, saute till it splutters, then add split black gram dal, jeera, curry leaves, hing and saute till dal turns red. Add chopped mango, mix well, saute till mango turns softer (closing with water filled lid). Add jaggery, saute till jaggery dissolves. add methi powder, turmeric powder, sesame powder, groundnut powder, salt, red chilli powder, saute for 10 minutes in a low flame. Can be served with hot rice/rotis. This can be stored up to 1 month. Heat oil in a kadai, add mustard seeds, wait till it splutters, then add split black gram dal, jeera, groundnuts, curry leaves, saute till dal turns red. Add green chillies, saute for a minute then add Oinions, saute till it turns golden brown. Add chopped potato, saute till it boils, add chopped tomato, saute till tomatoes turns softer. Mix red chilli powder in curd and add this into the kadai. Add water to the kadai, cook till it get boiled(bubbles will come out), add oats, mix well, close it with a lid and cook in a low flame till water disappears and oats are well cooked(add little water if required). Wash the okra under running water. Cut off the ends of the okra. Pat the okra dry with a clean kitchen towel. If you leave them wet, your dish will end up sticky and slimy. Slice into halves and set aside. Heat Oil in a cooking vessel, add mustard seeds, let it splutters, add split black gram, jeera, curry leaves, fry for 2 minutes. Add chopped bindi, fry till it turns golden brown. Add turmeric powder, salt, red chilli powder, groundnut powder, mix well, fry for 2 minutes, remove from heat. Today I am posting a variety dish yet delicious. Instead of throwing away the edges, this tasty dish can be prepared with less effort with new taste. Grind the Bindi edges for few seconds(not smooth paste just pices should be crushed slightly) like below photograph. Heat oil in a pan, add sesame seeds, groundnuts, fry for two minutes. Add Coarse paste and fry till it turns golden brown. Add salt, red chilli powder, coriander powder, fry for a minute. 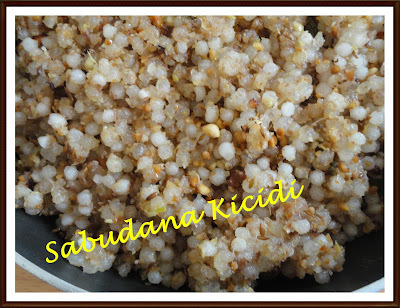 Today I am posting a traditional dish of telangana, most enjoyed in summer. This is my dam favorite recipe, it tastes katta meetha, can be prepared in less time with less ingredients. Heat oil in a pan, add mustard seeds, let it splutters, add Jeera, split black gram dal, curry leaves and cook till dal turns red. Add diced onions, saute till it turns light brown color, add chopped mango, 1/2 cup of water and saute till mangoes cook softer. Add jaggery, salt, coriander powder, red chilli powder, putani powder, Cook for 5 minutes in a low flame. Take a vessel, add wheat flour, salt, turmeric powder, Chopped palak leaves, ginger, garlic, green chilli pastes, 1 teaspoon of oil, curd and mix well. Make a soft dough like chapathi by adding sufficient water, keep a side for 30 minutes. Divide the dough into 8 equal sized balls, take a rolling pan, roll the ball in a circular shape like roti. Heat a pan, cook the paratha till brown freckles form, when both sides are cooked add a little oil and spread both the sides, cook till paratha turns golden brown. Heat ghee in a pan, add wheat flour, fry till it turns light brown. Take off pan from heat, add powdered jaggery and mix well. Add dry fruits, mix well. Boil toor dal with 2 cups of water, boil palak along with dal so that dal will get more flavour of palak and mix evenly. Heat oil in a pan, add mustard seeds, cook till it splutter, add black gram, jeera, hing, curry leaves, cook till dal turns red, add chopped green chillies, cook for a minute. Add chopped mango, add 3 teaspoons of water, close it with a lid, cook till mango get boiled, add turmeic powder, cook for 2 minutes. Add cooked toor dal, palak, add salt, chilli powder, cook for 5 minutes in a medium flame(add water if required). Pick 10 straight, plump, healthy looking chillies, wash and dry them in a kitchen towel, with a sharp knife make a vertical slit in the middle of chilli on one side for stuffing. Keep the ends intact . Insert the knife tip and pluck the thick white vein in the middle along with the seeds. Usually it will come off nicely with a sharp knife. After preparing all chillies in this way and keep a side. Heat a pan, add groundnuts, seasame seeds, coriander seeds, jeera, fry till seeds splutters(approx 3 minutes). To this, add salt, mint leaves, tamarind pulp and grind them to a fine paste(add little water if required but it should be very thick). Take ready to stuff chillies, fill the gap with the above filling nice and evenly one by one and keep them aside on a plate. Take a bowl, add besan, ajwain, salt, redchilli powder, soda, enough water to prepare medium thick batter of thick buttermilk consistency. Heat oil in a deep frying kadai, dip stuffed chillies One by one in batter and gently drop from the sides of kadai into hot oil and deep fry until golden. Serve hot with sprinkled chat masala and chopped onion. Combine all above ingredients except oil such that it is of pouring consistently like thick buttermilk. Pre- heat a tawa for a minute, sprinkle few drops of water if it sizzles the tawa is ready to cook, reduce heat. Pour a laddle full of batter from the outward base of the tawa in a circular motion, fill the gap with dosa batter. Dont pour the batter like a thick lump, but pour allover, evenly, filling the gaps, pour oil drops along edges of dosa and the gaps in the middle. Cook dosa for 3 - 4 minuts and flip it to cook for one minute. Serve this crispy hot dosa with cocnut chutney/ any pickle. Take a bowl, add maida, sooji, besan, curd, warm water and mix thoroughly and make sure that there are no lumps formed. See to it that the consistency is like a ribbon (when the mixture is dropped from a height, it should fall like a ribbon. Take 2 tabespoons of water dissolve food color/saffron and mix with the batter and keep a side for 8 hours(minimum 2 hours) to ferment. Next, prepare the sugar syrup by dissolving it in water and heating this mixture until it obtains the string consistency that is, when you place a drop of this sugar syrup between your fingers and stretch them apart, the syrup will look like a string between your fingers(theega paakam), remove from heat, add lime juice and keep a side. Pour the batter into jalebi maker/squeezing bottle/icing bag, heat oil in a pan (low-medium flame), pour the batter by squeezing the bottle/icing bag into the pan in a concentric circular motion to obtain a coil shape. Remove excess oil, immerse them into sugar syrup for at least 5-6 minutes such that they absorb the syrup well.